SOLD OUT ( no longer in stock ). 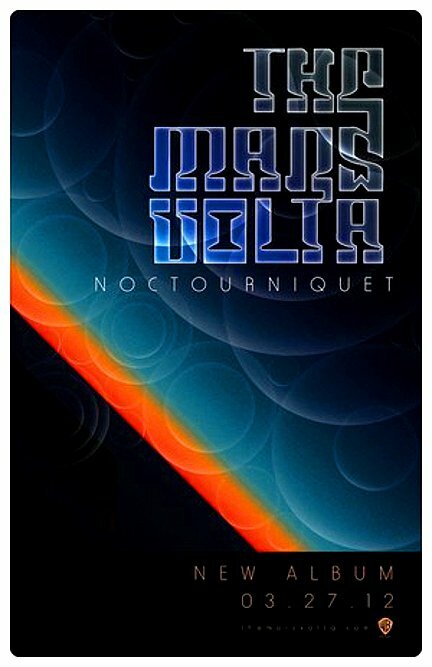 MARS VOLTA * Noctourniquet * Original Music Poster 2' x 3' Rare 2012 Mint New Condition. Large Original Poster for the March 2012 release of Mars Volta's new album * Noctourniquet *. Noctourniquet is the sixth studio album by American progressive rock band The Mars Volta, released on March 26, 2012 on Warner Bros.. Produced by guitarist and songwriter Omar Rodriguez-Lopez, it is the band's first studio album to feature drummer Deantoni Parks, and the first not to include contributions from long-time keyboardist Isaiah "Ikey" Owens and guitarist John Frusciante. Inspired by the children's nursery rhyme, Solomon Grundy, and the Greek myth of Hyacinthus, Noctourniquet is a concept album, with vocalist Cedric Bixler Zavala stating, "It's about embracing life for what it should be. There's a view of the elitist lifestyle - that being an artist is unattainable. I'm trying to write this story that reminds people that we're all artists." Rolling Stone calls Mars Volta " Hard Rock's most fascinating Sonic Freak Show. " This Rare Original Poster is Large Wall Size ( measures 2' foot wide by 3' foot high ) and is printed in Beautiful Brilliant , Razor-sharp 6 color production on thick heavy chrome-coat advertising poster stock paper. This is the Official Mars Volta Noctourniquet Poster printed in very Limited Edition. Rare , Authentic Mars Volta Noctourniquet Original Collectible ~ ready for framing , or simply hang as is. Great for an Apartment or Music Studio , Den or Office. This is a very rare Original Mars Volta Noctourniquet Poster in Brand New Condition and has been gently pre-folded once in the center at the factory. Will be gently rolled in a heavy duty tube and shipped Priority Mail with Delivery Confirmation / Tracking. This Original Poster is in Mint New Condition. Email with any questions before purchasing if you are unsure about something. We ONLY accept Money Orders , Cashiers Checks or U.S. Cash as payment ( we do NOT accept personal checks or online payment at all ). Please email about local pick-up , we are located in NYC in Times Square. All International Customers MUST email us before purchasing this item.